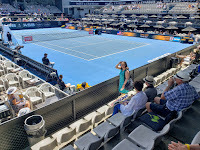 The general plan for our trip was to spend a week touring New Zealand then hop on a flight to Melbourne, Australia to take in a few days at the Australian Open. 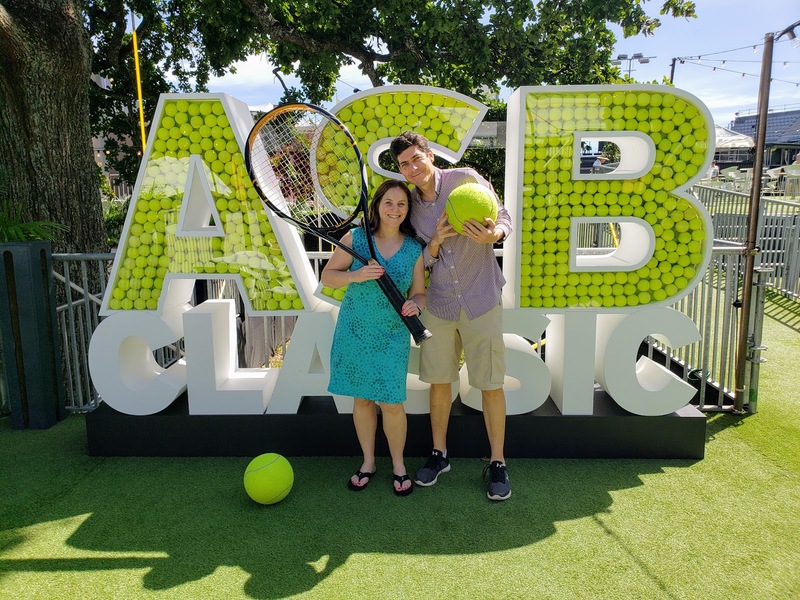 But as luck would have it, Shira didn't need to wait a week to see tennis. 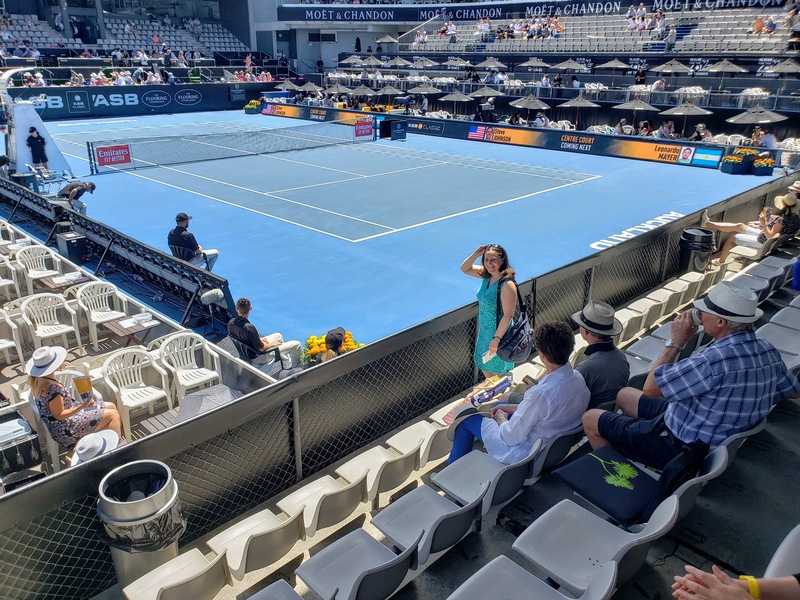 The Auckland Open Tennis Tournament happens to be going on this week and today we took in a day of the action. As we strolled the grounds we came around the corner to find John Isner practicing on one of the side courts. The venue is comparatively tiny, so it was a real joy getting to sit court side and watch Isner work on his serves. I was almost too close to the action to use the telephoto lens on my DSLR. As the first official match of the day was starting up, Shira led us to our seats. To my surprise, we sat in the first row directly behind one of the baselines. We were mere feet from one of the ball kids. Even I have to admit it was a thrilling to be so close. We cheered on as American Steve Johnson took on Mayer, Marach and Pavic took on Fognini and Berretini and Humbert took on Cuevas. For Johnson, Mayer and the doubles match, we were sitting close enough that we could hear the players as they chattered away. Steve Johnson for his part, thanked the ball boy every time he was handed a ball; so courteous. Fognini and Berretini were far less kind, chewing out a lines person for a call they didn't like and demanding snappier delivery of the balls from the ball kids. When Humbert took the court, he was accompanied by a ball kid. The two of them look liked brothers who had wandered onto their Dad's tennis court. Whatever Humbert lacks in age he made up for in skill, besting his opponent 7-5, 6-1. That kid is clearly the future of tennis. In many ways Auckland has a familiar feel to it. Sure, folks are driving on the wrong side of the road, but other than that and the accent, you'd be hard pressed to know you're not in the US. We're staying on a busy street with no shortage of shopping. Our way to the tennis courts brings us through a delightful park and a college campus. It all feels 'normal.' And then you have an experience like the one we had ordering a grilled cheese at the tournament. I mean technically it was bread, cheese and grilled. But it was an altogether different animal than the one my Mom used to make for me growing up. This was just a friendly reminder that we're half-way around the globe. 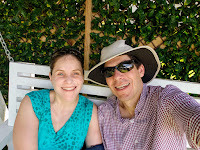 Tomorrow is our last day to experience Auckland and then we hit the road to explore more of New Zealand.